Also rokkakudou 六角堂. A hexagonal building of relatively small scale found at some temples. 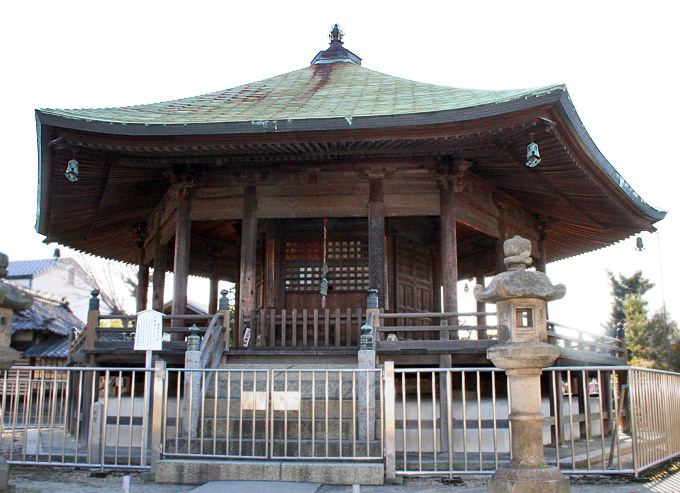 Like octagonal halls, rokkakudou are dedicated to a deity or to a revered priest, There are only two extant, both protected cultural properties. The larger is 8.73 m on each side and is located at Choukouji 長光寺 in Aichi prefecture. The building is dedicated to the deity *Jizou 地蔵, and is called *Jizoudou 地蔵堂 (1510). The outer worship area *gejin 外陣, is open like a veranda and is marked by thirteen pillars with no enclosing parts, fukihanachi 吹放. The inner sanctuary *naijin 内陣, is enclosed. It is also hexagonal in shape and has a rectangular altar *butsudan 仏壇, the width of the rear bay. Opposite the butsudan are timber shutters *shitomido 蔀戸 covered with a grid of lattice, that fills the bay facing the main steps. In the bays on either side are double hinged doors. Steps, positioned off center, give access to the open, outer worship area in bays on either side of the rear bay. Facing the main entrance, the rear bay on the left side has a single leaf sliding door. 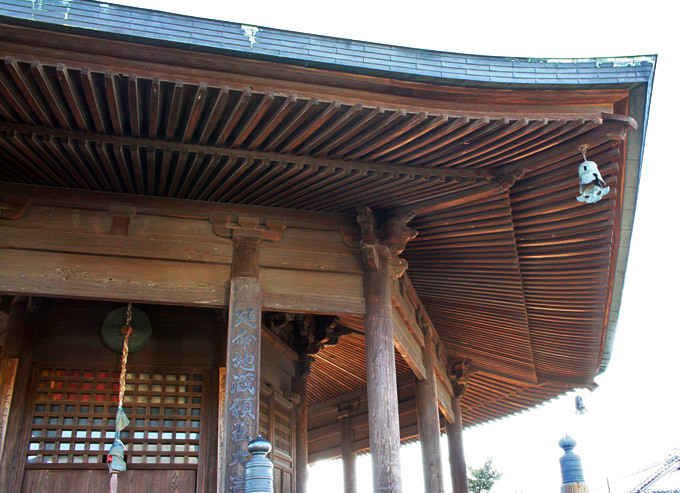 It is roofed with coppersheets made to resemble the shape of sod roofing *tochibuki 橡葺. Another hexagonal hall exists at Maｎpukuji 萬福寺 in Kyoto. It is dedicated to the temple's founder, Ingen Ryuuki 隠元隆�K (Ch; Yinyuan Longqi; 1595-1673), who brought the Oubaku 黄檗 Zen sect, to Japan from China. The building is called Manpukuji Juzou 萬福寺寿像 (1663). Each bay is 3.82 m wide. Circular windows that can be opened were constructed in the front bay and in the bays on either side. Atop the wall plates *daiwa 台輪, above each pillar, are 1-stepped bracket complexes *degumi 出組. Both base rafters *jidaruki 地垂木, and flying rafters *hien daruki 飛檐垂木, are arranged to radiate from the center of each bay to the hip rafters *sumigi 隅木, which form the corner ridges. The roof can be broadly classified as pyramidal *hougyou yane 宝形屋根, but may be more exactly termed, rokuchuu yane 六柱屋根, meaning six sections converging at the top. The roofing is tile *hongawarabuki 本瓦葺. The peak of the roof is covered by two metal sis-sided box-like forms *roban 露盤. The upper one is smaller, and is topped by a rounded form called a *fukubachi 伏鉢, which is crowned by a tear-drop shaped form *houju 宝珠.